Introducing the newest member of our antique collection, our purdy little sofa thing. We got (I think) a very fair deal on it. The show was winding down, and many of the dealers were looking to get rid of builky items such as this. 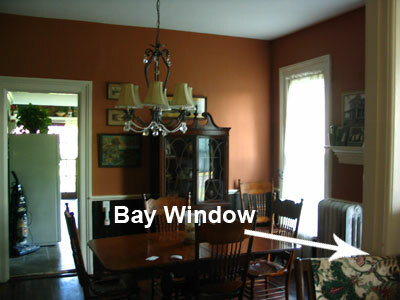 It’s not in perfect condition – the back needs regluing and the velvet upholstery (which appears to be original) is faded and a little worn at the arms, but it looks perfect sitting in our bay window. The wood tone matches our existing antiques (mostly inherited), and the fabric is an orangey-red-brown color that ties in really well with the adjacent dining room wall color. It’s the type of sofa I picture old movie stars reclining on. It’s feminine and dramatic – definitely makes more of a statement than the two Salvation Army chairs I had in that spot previously! Anyone have any guesses as to it’s era? The dealer said probably 30’s – does that sound right? I have one very similar that I was told belonged to my Great, Great, Grandmother. She died in 1915, so I always assumed mine was from the late 19th Century. Either way, it looks great. That’s beauteeeeful! And in such fantastic shape! Somehow I missed the ‘after’ post on the dining room. Wowsa! That’s gorgeous! And I love, love, love that chandelier. I’d be surprised if that was 20th century, unless it was a reproduction made in the 1920s or ’30s. Looks like late 19th century to me. 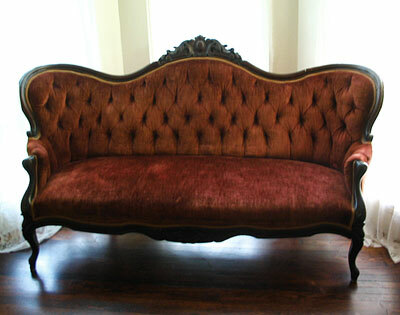 Without being up-close and personal with your setee, I would guess 1890s by the style. It isn’t fancy enough to be Rococco which would make it much older. It isn’t a style that was popular in the 1900s. Check out some books on furniture at the library. Most dealers at shows know very little about old stuff, if you can know just a bit more than most of them you will do OK. The upholstery may in fact be mohair. Buy some cushions at Pier 1 to hide the wear on the arm! Good job you had the Teaguemobile! 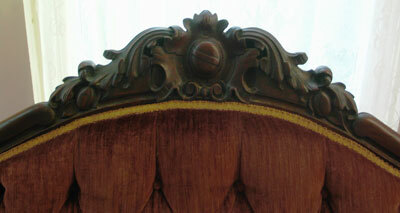 Its late 1860’s or early 1870’s Rococo Revival, and looks like 50’s or 60’s Velvet. Originally, was probably covered in horsehair , which is a black, shinny and stiff fabric. Very nice piece with great proportions. Wow. Great find! Looks gorgeous and fits right in! Reminds me of one our grandmother had…but it was green velvet. Awesome. So glad you posted your trip to Brimfield. Until you’ve experienced it in person, you just can’t be imagine how huge it is. Your settee is lovely and looks great in the house. We’re doing a restoration of our Second Empire Brick Victorian as well. Lots left to do…but the results are stunning. Love reading yours and others’ blogs..you guys are doing some incredible work! Ok, that’s kinda what I was thinking after doing some early research – that the frame was older than the dealer suggested. I will have to continue my research to find out more! Whatever age it is, it looks very much at home in our house. Thanks for the input guys! Very pretty! I would have guessed older, too. But looks like a nice piece! I’ve always been reluctant to go to shows like Brimfield after friends of our who were dealers, told us of all the wheeling and dealing that goes on amongst them before the show even opens! But buying before the show ends and people don’t want to lug things back home, I think evens the playing field!